Social Wine & Tapas is Jason Atherton’s sixth London restaurant, it is the brainchild of his chief sommelier and long time servant Laure Patry (she will also be the restaurant’s maitre’d). Whilst Atherton is backing the venture he has stated that he will give her free rein on the restaurant’s future direction. Patry has solid pedigree, hailing from the Loire Valley, she moved to the UK to work for Gordon Ramsay and Claridge’s, before moving to work for Atherton. In addition to being a well respected wine expert she also has a good business brain, having set up the Wine Club – a website that sells sommelier recommended bottles from small wineries. Unsurprisingly, the focus here is on wine: their list is 500 bottles strong with a backbone of low intervention and organic wines, along with some traditional classics thrown in for good measure. They also have a decent choice of lower value options, with the cheapest bottle at £20, and they have a wide range of wines by the glass (they use the Coravin system, which removes wine through a needle inserted in the cork and replaces it with argon gas, keeping the cork intact and the wine fresh). The restaurant has 70 covers and also houses a little bottle shop. 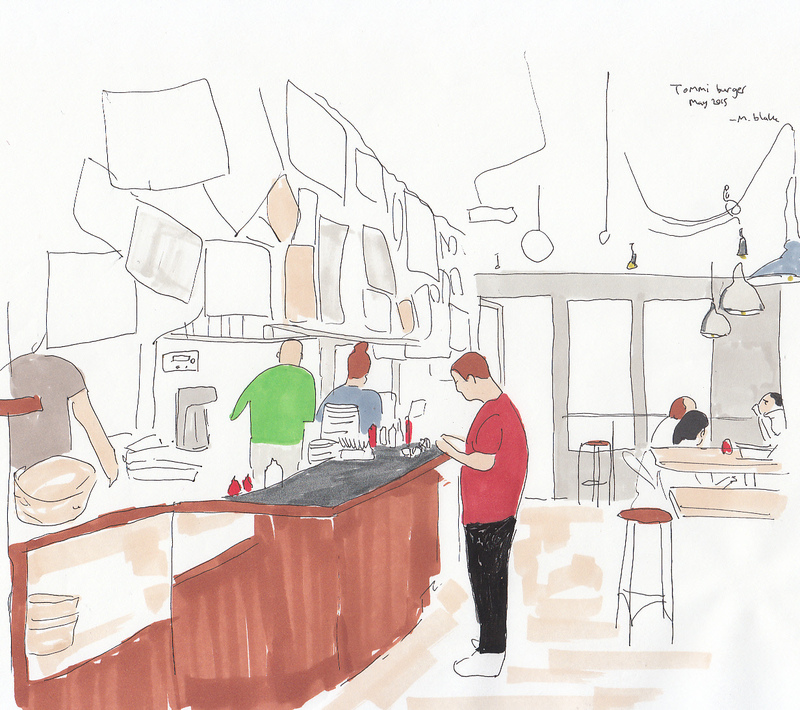 The slick interior design is by Russell Sage, who also fitted out Atherton’s City Social and Dishoom. Head chef Frankie van Loo is from Yorkshire and worked for Atherton at the Social Eating House. His menu is predominately tapas, with a few larger (mostly meat) plates and, unusually for a Spanish menu, it also has a good range of veggie dishes. 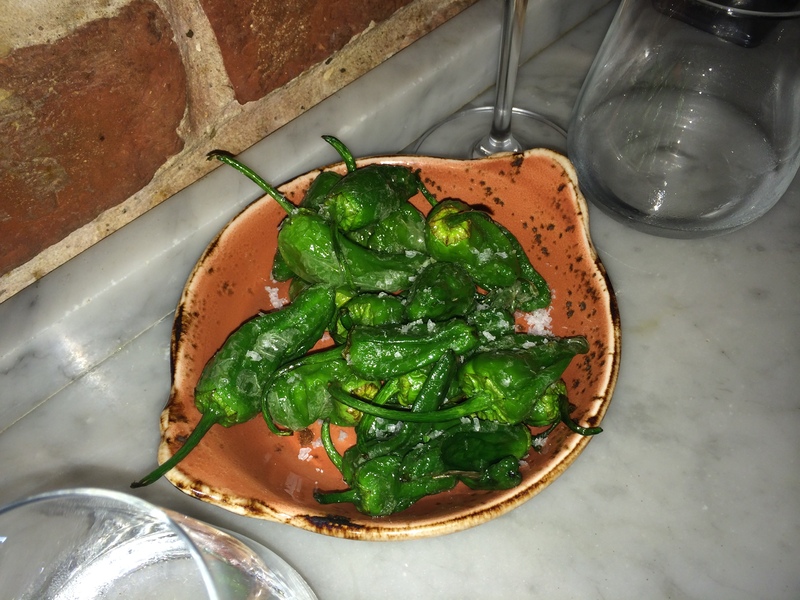 We started with some decent padron peppers (£4.5) – they were slightly charred and properly seasoned, but they didn’t have as much character (or fire) as the equivalent dish at Jose. The ham croquettes, however, were exemplary (£4), coated in a light and crispy layer of breadcrumbs, they contained wonderful little morsels of ham and mild, gooey Spanish cheese. The stand-out dish of the evening was curried hake, confit baby leek and mayonnaise (£9.5). The hake was extremely fresh – its flesh was soft and flaky, but nicely caramelised on the outside and finished with a hint of curry powder. The mayonnaise was the perfect creamy texture and combined nicely with the confit leeks. The salchichon (£6) was disappointing – it had been inexpertly cut (too think) and was quite chewy; the meat needed some more seasoning and a lot more garlic. A fresh sardine on toast (£5) was served with a zingy tomato paste and a caper/pepper/onion medley. The fish was (again) really fresh and the its meaty flavour stood up well to the punchy toppings. “It isn’t cheap but the atmosphere and tasty, moreish tapas provide a welcome injection of Latin passion into one of the city’s more soulless corners” City A.M.
Margaret Thatcher conceived and Prince Charles opened Broadgate Arena (now known as Broadgate Circle) in 1987 – it was designed by Arup Associates in a post-modern concrete-laden style. The development won numerous plaudits, including the Royal Institute of British Architects’ National Award in 1991, but an application for listing was rejected by Tory culture secretary Jeremy Hunt a few years ago. This left the door open for further development and although the circle is used as an ice rink during the winter there had been demand to make better use of the space during the rest of the year, leading to Arup being brought back in to create an arena for shopping and eating. They were able to attract an impressive list of restaurants to the new venture, including Brixton’s Franco Manco, Yauatcha (from the Hakkasan Group), the Botanist and the wonderful José Pizzaro. 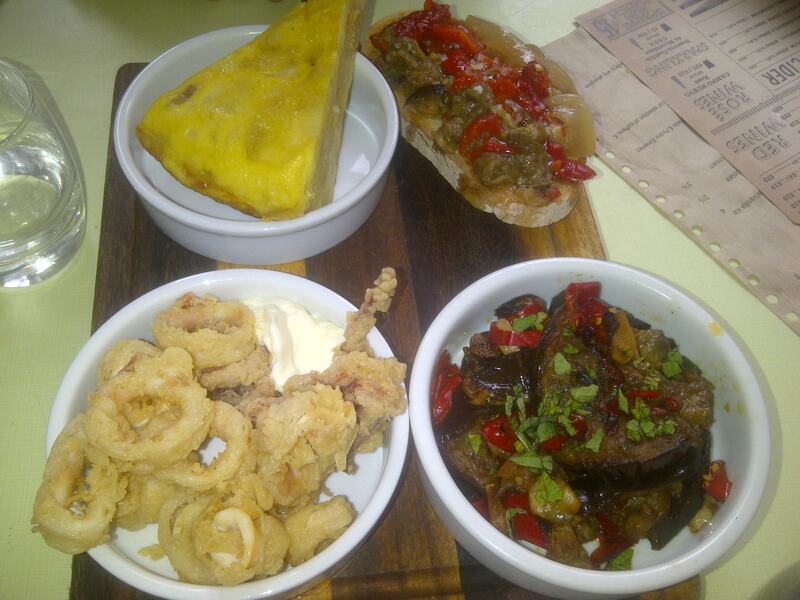 As José on Bermondsey street is one of my favourite tapas places I was keen to see what José Broadgate has to offer. The restaurant has 65 covers and so is a lot bigger than the tiny, intimate José; a lot of money has been invested in the fit-out, designed by CADA – there are some nice features, including concrete panels with patterns inspired by Pizzaro’s Extremadura hometown, but on the whole it feels a bit corporate (I much prefer the rustically decorated José). The menu is mainly composed of tapas dishes and charcuterie, they also serve a range of Spanish breakfast dishes which I think will be a hit with local desk monkeys. We started with some decent padron peppers (£5) and some beautifully rich and nutty Jamón ibérico de bellota (ie acorn-fed ibérico ham) sourced from Cinco Jotas (albeit for a whopping £23). 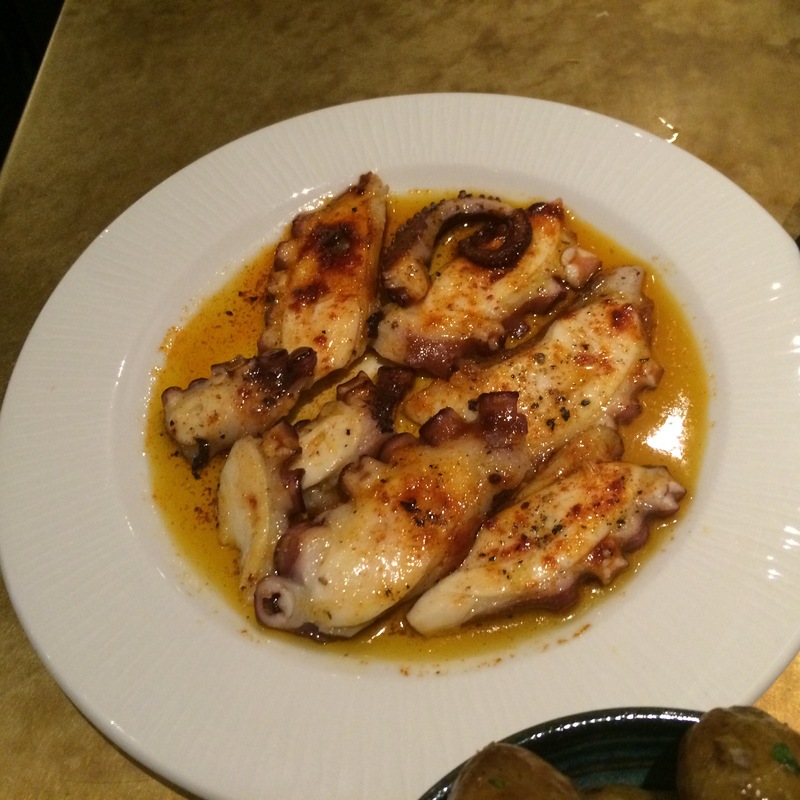 Next, we had some grilled octopus with Catalan olive oil (£10) – the octopus was cooked perfectly so it was soft and melt in the mouth; its salty, sea flavour was enhanced by the rich olive oil and a hint of paprika. There are five larger dishes on the menu (£12-25, as well as the presa ibérico which has been getting good reviews) – we chose the whole grilled baby turbot (£24) with pan con tomate and a green salad. 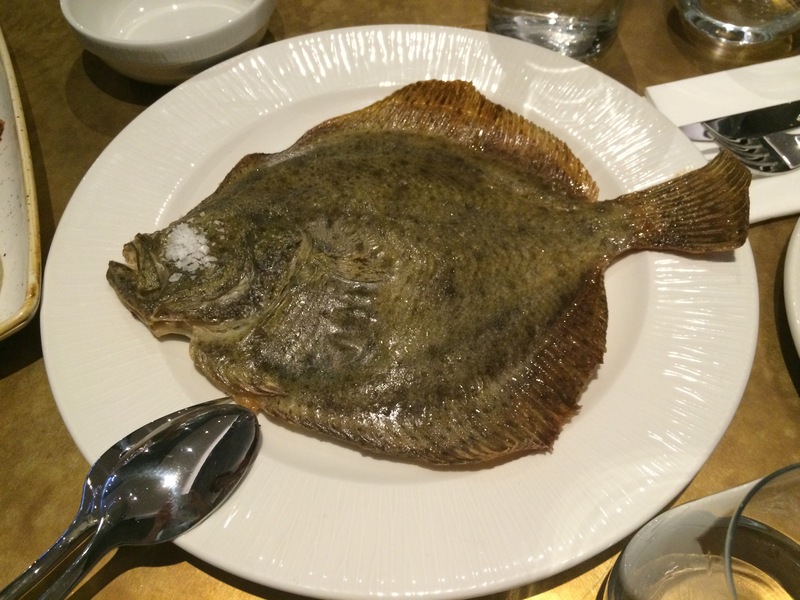 The fish was very fresh and exquisitely cooked so that it was still moist and full of flavour. The dearth of sauce or seasoning let the true flavour of the fish stand out. Aubergine stuffed with a traditional Extremadura dish called migas (stale bread soaked in water, garlic, paprika, and olive oil – £12) was interesting and I guess authentic, but a tad boring, especially given the quality of the rest of the dishes we sampled. We finished with an amazing dessert of chocolate with olive oil and salt (£6) – this was effectively a chocolate mousse with the cream replaced with olive oil, the resultant dessert was rich, decadent and as it used dark chocolate, fairly healthy – a great end to our meal. Tomas Tómasson opened his first burger joint in Reykjavik in 1981, quickly building a mini-empire over the next three years with six restaurants that flipped over a million burgers. He sold up in 1984 and pursued other restaurant interests, including opening Iceland’s first Hard Rock Cafe and rejuvenating Reykjavik’s plush Hotel Borg. Tómasson took a break from the business in the early 2000s, travelling the world and eating loads of hamburgers (research, apparently) before opening the second wave of Tommi’s burger joints in 2004. Four more restaurants followed, with expansion into London in 2012, then Copenhagen and Berlin in 2014. Apparently Tommi, whose portrait hangs in all the restaurants (he looks a lot like Hemingway), has eaten a burger every day since the first of the new joints over a decade ago (burgers for Christmas?) and is often found working behind the grill in his restaurants. The menu is pretty simple – a beef or veggie burger (both £6.9) and a steak burger for £8.9, the only side on offer is fries (£2.75) and you can add bacon and extra cheese for £1. 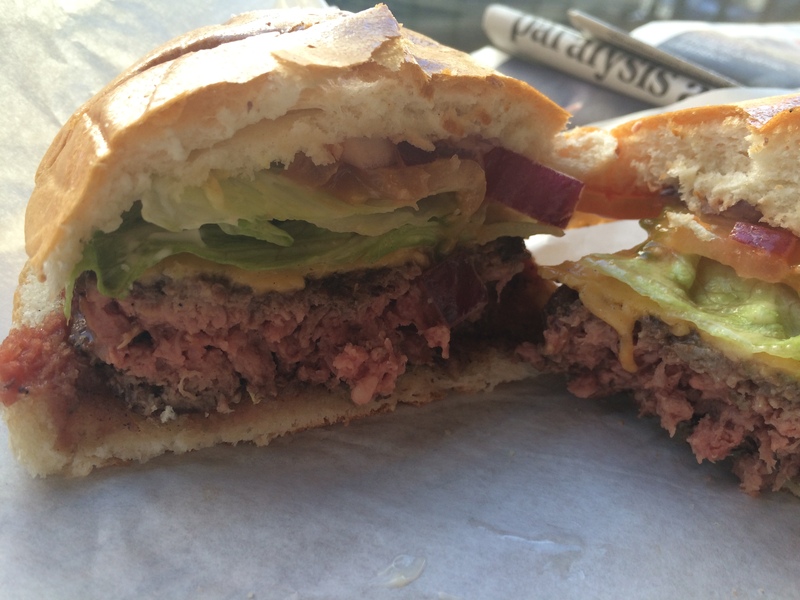 Their beef comes from traditional butcher HG Walter in Baron’s Court and the mince used in my burger was of good quality, lean and tasty. The patty had been cooked medium using coarsely chopped mince and was fairly juicy, but underseasoned. All burgers come with standard toppings of lettuce, american cheese, tomato and onion- in the age of wacky toppings many find this simplicity refreshing, but I found it a bit dull and wasn’t keen on the raw, bitter red onion. The bun (supplied by monolith bakery Millers which is owned by Alex Polizzi, that annoying TV hotel makeover woman) was quite doughy and starchy – I much prefer a brioche style bun. The fries had been bought and cooked from frozen and were unremarkable. 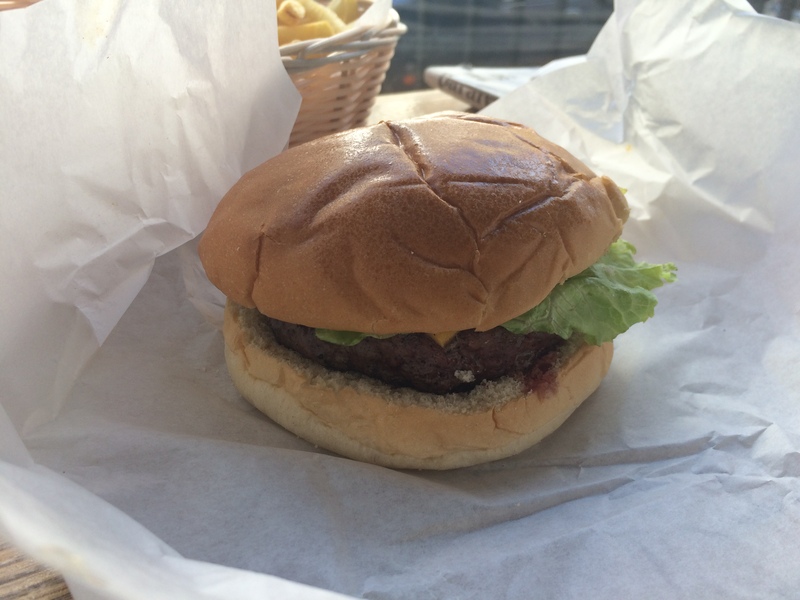 Apart from the quality of the meat used in the burger I was underwhelmed by Tommi’s offering. Categories: Burgers, Spanish | Permalink. 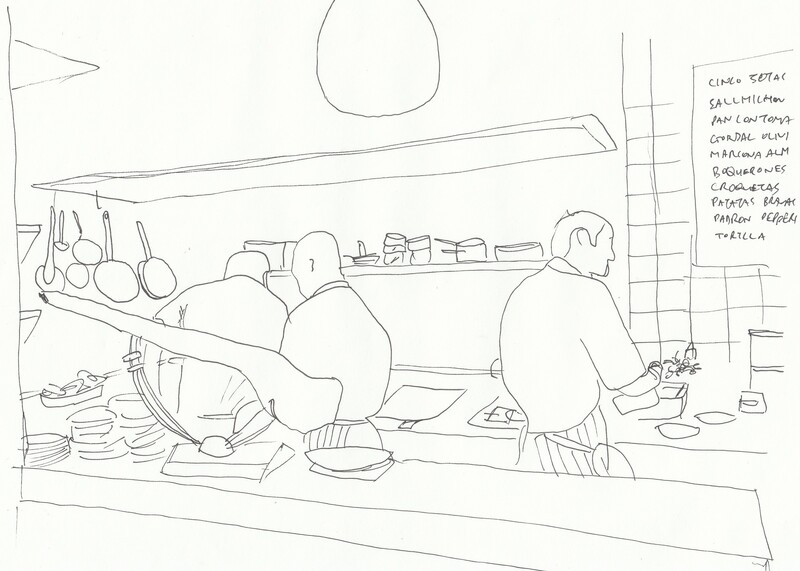 Following a tenure as head chef at Tapas Brindisa, José Pizzaro opened José in 2011 – it was the first of London’s new wave of stripped-back, authentic tapas restaurants (also see Bar Tozino). Pizzaro is from Extremadura, a distinctive region of Spain which borders Portugal – the area is famous for its agriculture and in particular, the black Iberico pigs which munch mounds of acorns in oak groves. José does not accept bookings and has very few seats, so expect to stand for a chunk (or possibly all) of your visit. The staff will take drinks orders when you are in the queue and are great at keeping track of your place in the pecking order, meaning you can wait, relax and enjoy your drink. The chalkboard menu is short and simple, featuring some old classics like tortilla but also including some more unusual Spanish regional dishes, like Catalan butifarra (described below). We started with a safe bet, patatas bravas (£5), the potatoes (which I think were maris piper) had good colour and were perfectly crispy. They came smothered in a rich tomato and garlic sauce, which was finished with a hint of paprika. 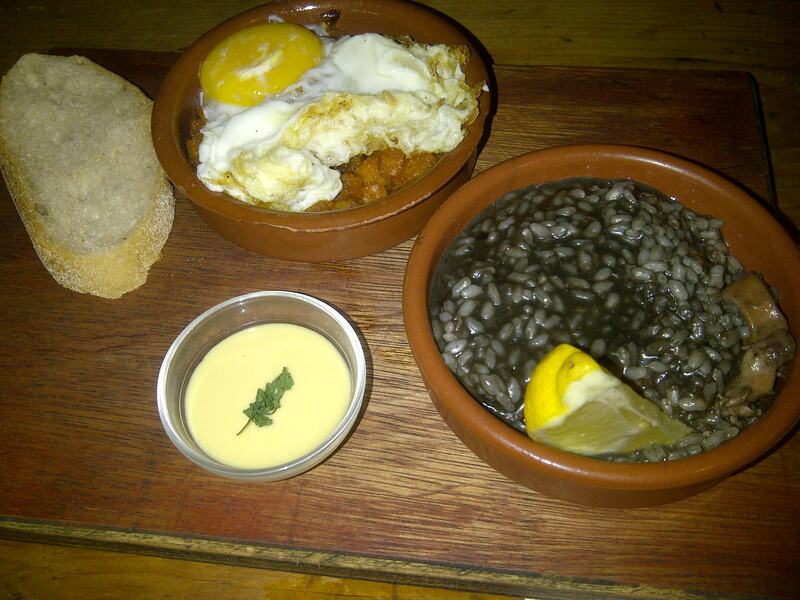 There was also a generous helping of very garlicky aioli which had been freshly prepared with good quality eggs. Our next dish was a russian roulette of padron peppers (£5) – whilst the majority were mild and refreshing, a couple of them were so spicy that they made my eyes water. Supposedly around a fifth of the peppers turn out hot, depending on the amount of water and sunlight they are exposed to. When I spotted butifarra (£7) on the menu I couldn’t resist it, I have fond memories of munching butifarra in Catalonia: raw and thinly sliced, grilled with white beans or fried atop sliced bread. 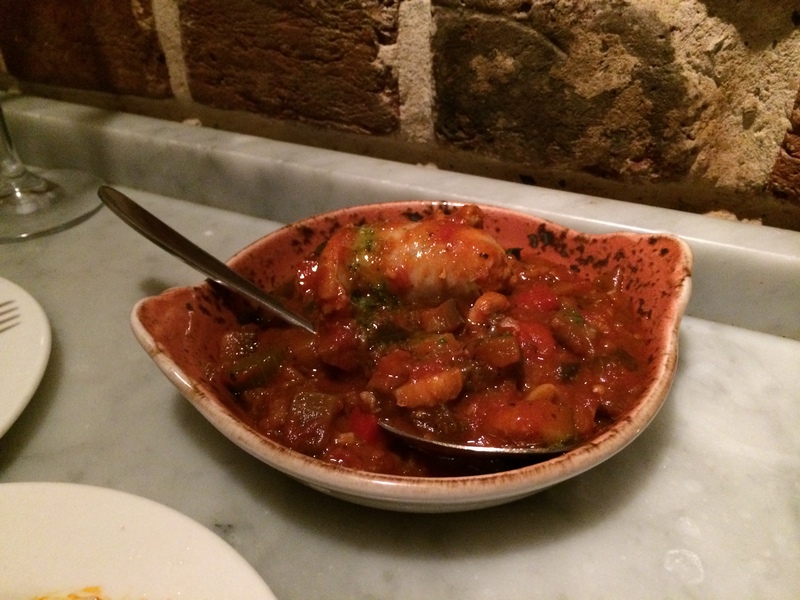 José’s offering was served in pisto, which is a Spanish slant on ratatouille, featuring courgettes and peppers. It was tasty enough, but a bit underseasoned. The butifarra was disappointing: the quality of the meat was not great, it seemed more like offal rather than (as it should have been) leg, shoulder and loin. It must be very hard to source good quality butifarra in Britain; this was possibly an English butcher’s failed attempt to recreate it. We finished with fried calamares and octopus (£9) which were wonderfully fresh, encased in a light and thin batter – the squid was melt in the mouth and had a mild, sweet flavour; the baby octopus was firm and meaty. And a final note on the (entirely Spanish) wine and sherry lists: these are generally served by the glass and are listed on the blackboard by vineyard (not grape) – so unless you know a lot about Spanish wine I would advise you to ask the staff for some guidance. 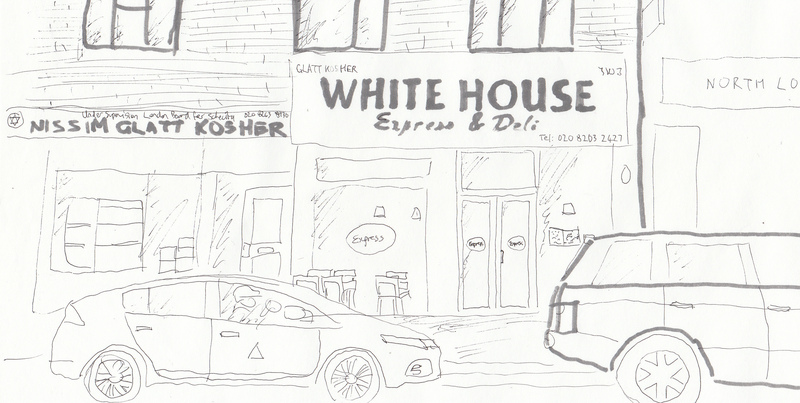 White House is a Kosher Israeli grill restaurant in the London-Jewish heartland of Hendon. Bizarrely, the menu strays into Thai dishes, but I would stick to the traditional middle eastern grills, which include Shishlik (Israeli lamb Shish kebab), Sharwarma and Shnitzel. 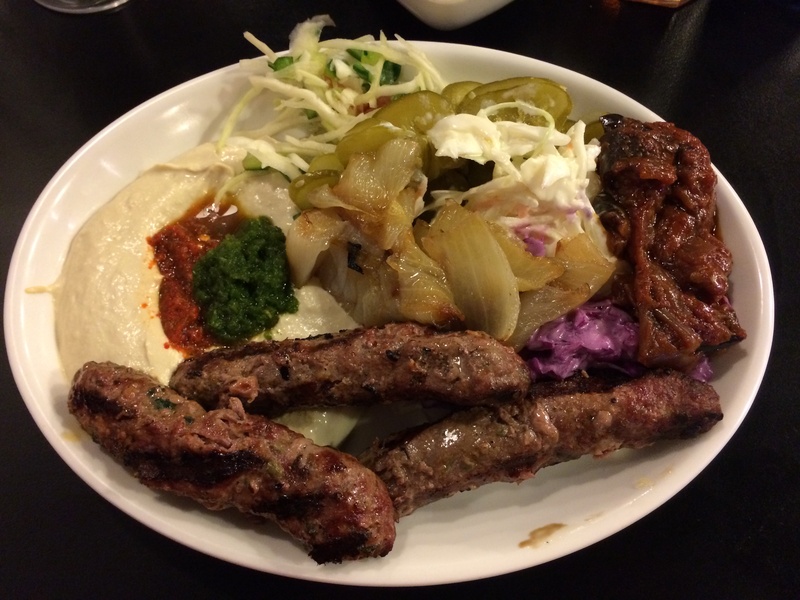 You can choose from a wide range of salads and sides with all the meat dishes – I opted for a bit of everything and was rewarded with creamy coleslaw, tart red cabbage, sour refreshing gherkin, and the star of the show, sweet roasted onions. My beef kebab (£15) was served with a tasty char on the outside; the inside was slightly pink and completely melt in the mouth. The meat had just the right fat content to make the kebab juicy, but not fatty. Perhaps unsurprisingly, the hummus was fantastic – it had a deep, earthy flavour with bitter tahini undercurrents. 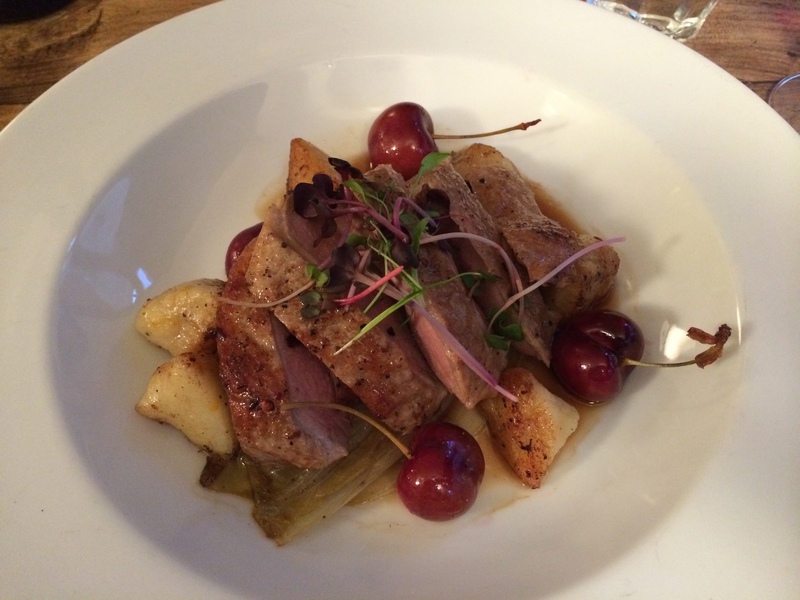 The photo below does not do the meal justice – this was a truly refined and perfectly executed dish. I washed my food down with a quaffable kosher red from Argentina which was very reasonably priced at £4 for a large glass. 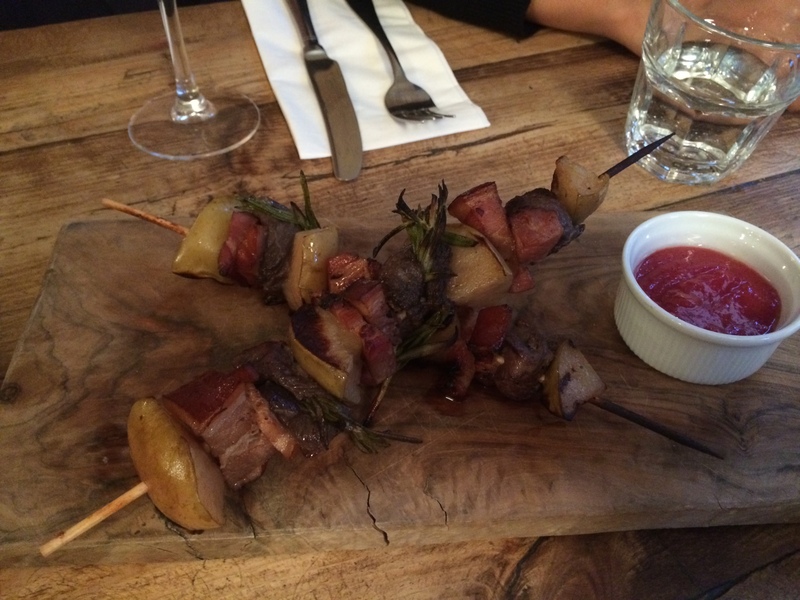 Elk is a Scando-British restaurant/bar a few steps from Upper Street. The decor owes inspiration to Swedish summer houses, hipster East London bars and Victorian public toilets…..it is a real mismash, but manages to achieve both individuality and comfort. 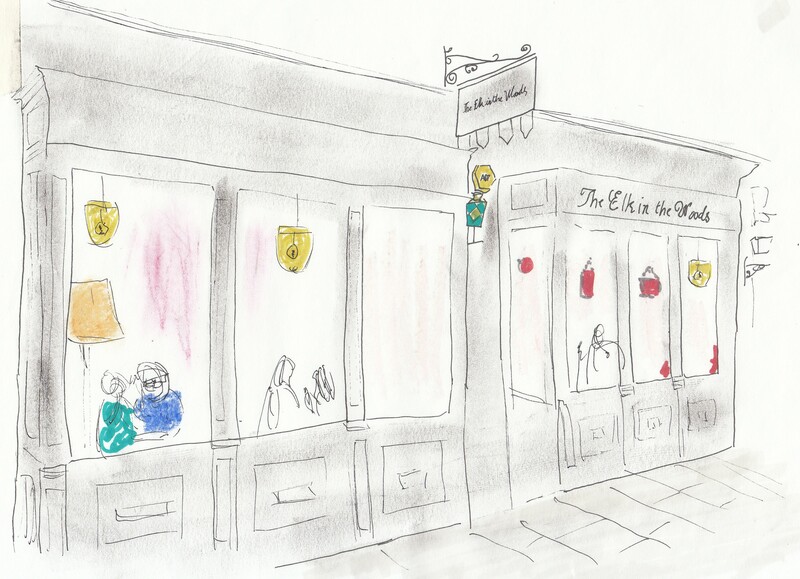 They serve an extremely popular and diverse breakfast menu including elk sausage baked eggs and smoked cod kedgeree (they also use Monmouth beans for their coffee). Unfortunately, it is a bit far for me to drag myself on a weekend morning, so we went for dinner on a busy Friday night. The menu is long, rich and rather spendy: we started with elk kebab (£6.5) with apple and bacon, the meat was smoky but rather chewy – a rather disappointing signature dish. More pleasing was the special of smoked cauliflower (£5) which had a nice balance of creaminess and smokiness. For main course I had home smoked duck, braised chicory, dumplings and pickled cherries (£15.5) which was also a bit disappointing, the dish was too sweet and the duck overly smoked. The accompanying dumplings were under-seasoned and their texture was stringy. For dessert I couldn’t resist the homemade popcorn ice cream sandwich with salted caramel (£5.1) but in reality the dish was highly calorific, the sandwich was made of pan loaf and the popcorn stone cold. I pride myself on having a tummy of steel, but after all of the rich dishes, lots of meat and very few greens I felt rather ill. I think the menu needs to be slimmed down, the smoking tamed and portion sizes (and prices) trimmed. The concept is good but the execution needs some more work. There was great hype and long queues when Koya opened a few years ago, but now things have calmed down and you should only expect to wait on weekends and even then for a short time only. They specialise in udon (thick wheatflour) noodles which are served in four different ways: hot noodles in hot broth, cold noodles in hot broth, cold noodles with cold dipping sauce, or cold noodles with a cold pouring sauce (do you follow?!). There is a lot of labour in the production of the noodles – they are made fresh every day and painstakingly rolled out by foot (thankfully covered in plastic sheeting). I opted for the day’s special of hot noodles in hot pork and miso broth, topped with a tempura langoustine (£7.9). The broth was complex and salty, with bags of umami; the noodles were firm and slightly sticky – simple but very tasty food. 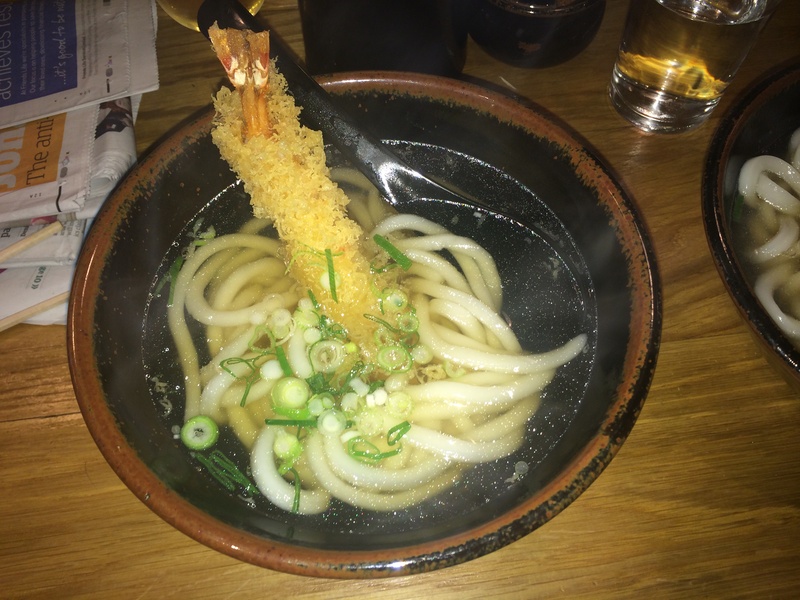 Udon is essentially fast food in Japan and I suppose the service/atmosphere at Koya reflects this – it is rather clinical and does not encourage you to linger for long. Brindisa have a London mini-chain of tapas restaurants and Spanish produce shops – their home base is at Borough market and they have restaurants in Shoreditch, South Kensington and Soho. They have recently opened up in Brixton, a few minutes’ walk from the tube station. The shop has a tiny kitchen and mainly serves “Llescas” – a Catalan invention of stale bread slices rubbed with tomato and garlic then topped with cured ham or vegetables. 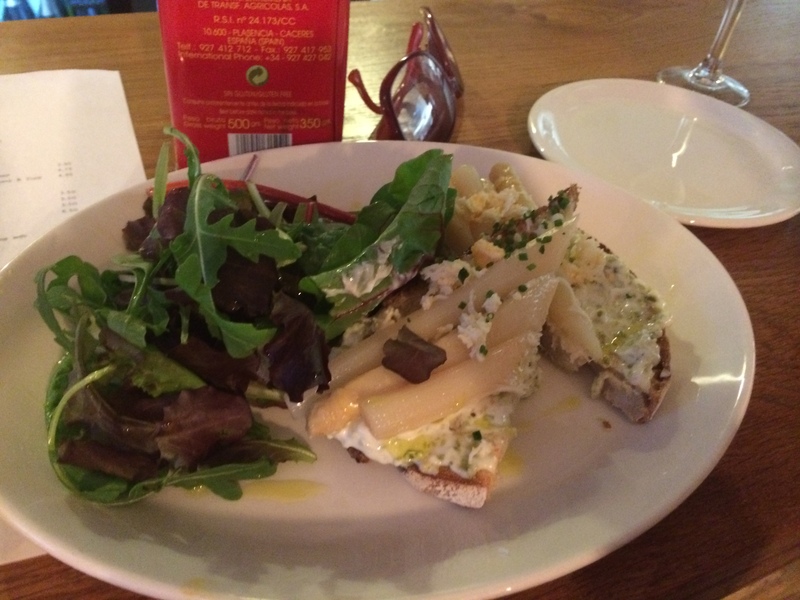 We started with a wonderful white asparagus, chive and soft cheese dish (£5.25) – the asparagus was earthy and fresh (we should really grow more white asparagus in the UK) nicely complemented by the mild soft cheese. We followed with some decent Salchichon (£3.95) and Chorizo (£5.25) which was of better quality than you can buy in the supermarket – the portions were generous and the dish was served with side salad. The menu is small and not very diverse, which lead us to order a Manchego Llesca (£5.45) even though I think that Manchego cheese is rather boring, again the cheese was of decent quality but it did not have enough character to be exciting. We finished with a grilled anchovy dish (£5.75)- the anchovies were large and meaty with a nice level of saltiness. Their wine list is very reasonably priced – the cheapest glass is £3.75. Categories: Israeli, Japanese, Scandinavian, Spanish | Permalink. 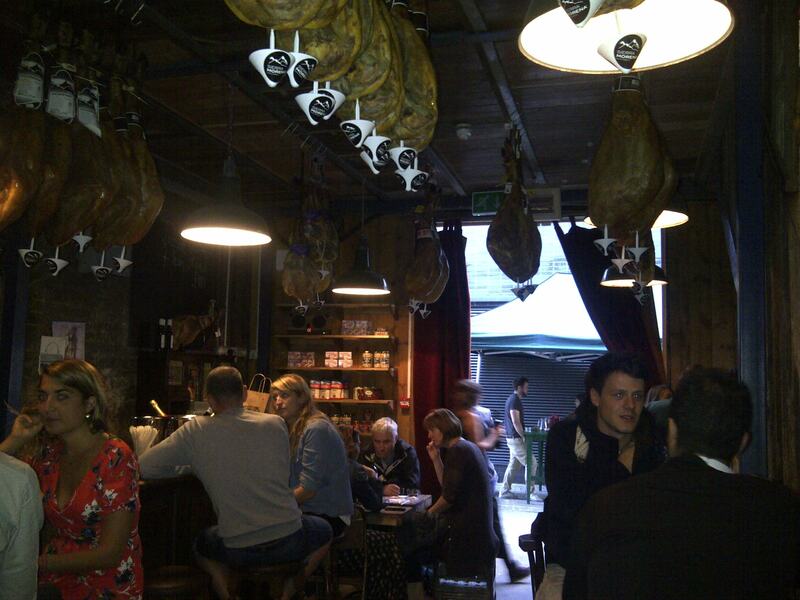 Bar Tozino advertises itself as a Jamon bodega (literally “ham winery”) and focuses on Iberico ham and Sherry. 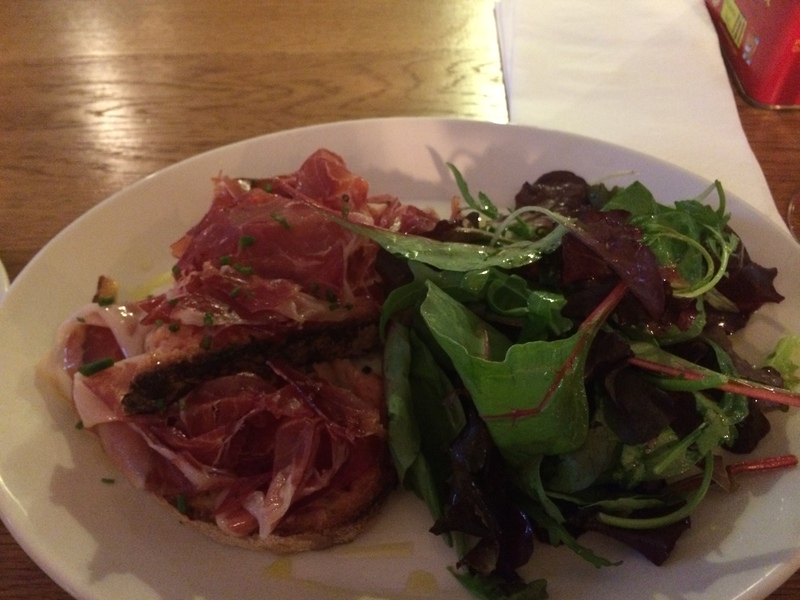 Iberico ham comes from black Iberico pigs which are large, very fat animals, meaning their meat can be cured for longer and it picks up a much more complex flavour. Acorn-fed Iberico (Jamon Bellota) is the most expensive cut because the pigs really love acorns and it helps them really plump out. It is housed in a little dank railway arch on Lassco Ropewalk: I would recommend having a look at the funky antiques in the Lassco stores, which range from Prussian army uniforms to Victorian school tables and silver tea sets. The ropewalk, bookended by the fantastic 40 Malty Street has a weekend market which includes a great array of stallholders including Craft Coffee, Little Bird Gin, Monty’s – a Jewish deli with killer salt beef – and a chap that specialises in Mexican chilli paste. Tozino isn’t just about ham though – they also serve some bog standard tapas which is mostly meaty (eg slow cooked pork shoulder; chorizo and chickpea stew) as well as some Manchego-heavy cheese plates. I enjoyed my squid ink risotto with chorizo – the rice was nicely cooked and the chorizo was good quality, not too chewy, with a slight paprika kick. Baked eggs with chickpeas was a very rustic dish which didn’t make the heart race – I’m afraid that the small kitchen at Tozino won’t be producing any ground breaking tapas, you will be better to focus on the Iberico. And so to the main event: our Jamon, which was nutty, salty/sweet and melt in the mouth; as good as what I have eaten in Spain. The ham needs to be treated with care and cut in a very particular way to avoid it becoming very chewy, but the staff at Tozino really know what they are doing. They also have a great selection of Sherries and the bar staff are very generous at letting you have samples before you order. I went for a medium dry Amontillado which, despite its initial tartness, had a ripe sweet finish. 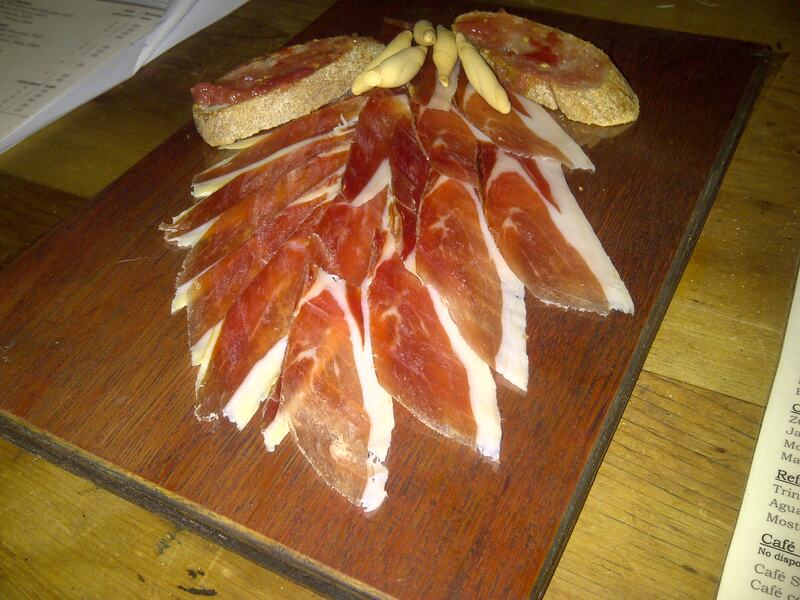 Verdict: good value Iberico ham that deserves to be washed down with some crisp, dry Sherry. Also see: Perfect Trough and TFF. 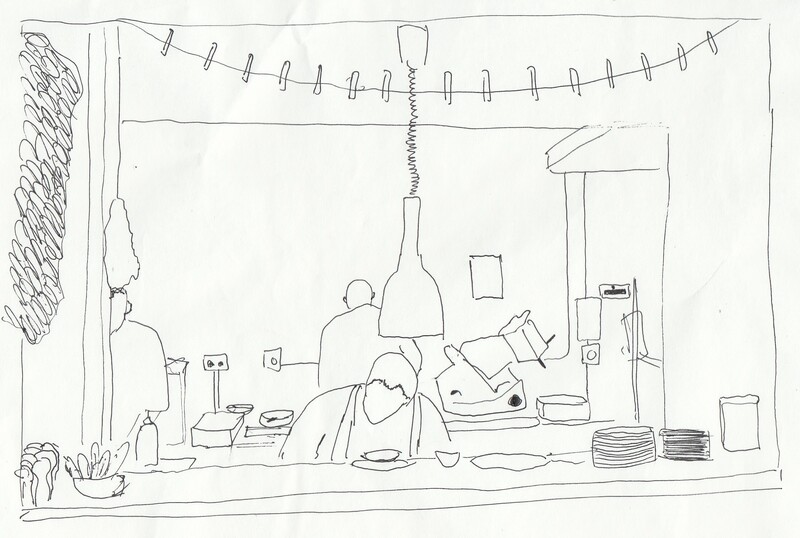 Seven is a hip tapas bar in Brixton village, a stone’s throw away from pizza pioneers Franco Manca. 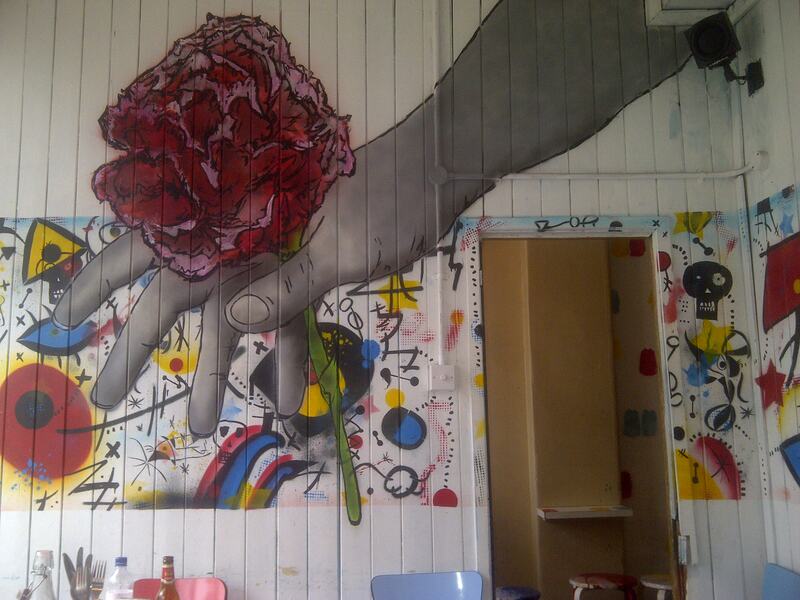 It is a buzzing and shambolic place with graffiti art on the walls, a rickety staircase and charity shop furniture. They serve up a heavily anglicised version of pintxos which is a Basque slant on tapas and involves lots of seafood on little slices of bread skewered with sticks. I haven’t been to the Basque country but I have been to an authentic pintxos place in Madrid and the range of tapas there was a lot more interesting that at Seven (they had things like octopus, blood sausages, cuttlefish and hake). We obviously have different produce in the UK, but for me it is a bit of stretch to call the food served at Seven pintxos. However, grumbles over nomenclature aside, the food they serve is very tasty. They also have a traditional cocktail list and I was very happy with my Old Fashioned – it is a very hectic but fun place to have a drink (although they close at 10pm). We went at lunchtime so weren’t too extravagant. We had four tapas: an extremely good tortilla (£3) made with very fresh eggs and cooked to perfection – the potato had nicely broken into the egg and the texture was light and moist. 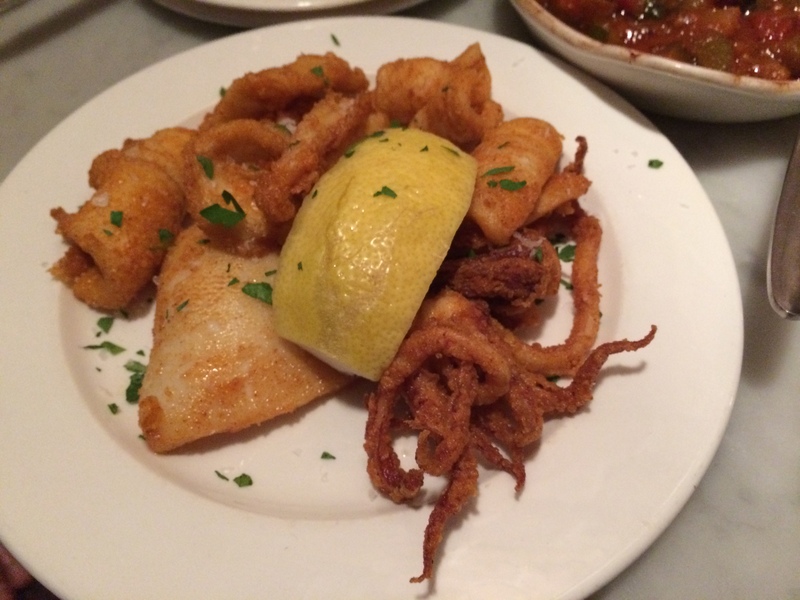 Fried calamari (£5) was crisp and nicely chewy. Roasted aubergine (£4) was simple but well executed – the aubergine had been properly salted so that all the bitterness was taken away. We also went for caramelised aubergine with mint and chilli (£4.5) which was drizzled in a beautiful sherry vinaigrette. Also see: caviargirl and Sybaricious.